Made in Japan and crafted from ceramic, this Japanese saki set is a tasteful addition for sake lovers. Featuring a classic white background and an elegantly simply motif of dragonflies in navy blue, this saki set features four sake cups and a sake jug. Dragonflies are well loved in Japan. It is believed that they bring good luck. Commonly found by the water during the summer, dragonflies are seen as symbols of good harvest, and are graceful bringers of good fortune. This gorgeous Japanese saki set is simple yet charming. 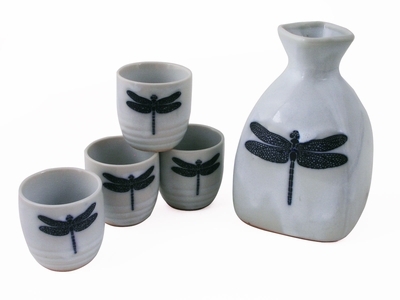 Featuring a sake jug with the dragonfly motif with a unique square lip and lovely curvy sides, this Japanese sake set also features four beautiful matching sake cups with ribbed design along the sides.